If you were a registered user of this site and are no longer able to access the registered users area, please re-register. We are sorry for this inconvenience. The 2019 Hall of Fame Banquet and inductee presentations will be held on October 5, 2019 Do you know a Galion High School Graduate that deserves recognition for outstanding accomplishments in their careers and communities? Please fill out a nomination form for that individual to be considered for that honor. Nominating forms are due by June 1, 2019. Click on the banner below to print out the nominating criteria and and form. Provide as much information as possible, but most importantly nominate some one you feel is deserving of recognition. These links will access pages dedicted to the inductees into the Hall of Fame. 2009 inductees into the Hall of Fame. 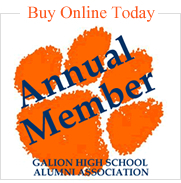 Donate to the Galion Alumni Association Project Fund. Navigate to your Class Home Page: To find your class home page, use the menu located under the main menu above to select the decade. This will open a menu to the right listing the class years. Click on your class year and you will be taken to that home menu page. 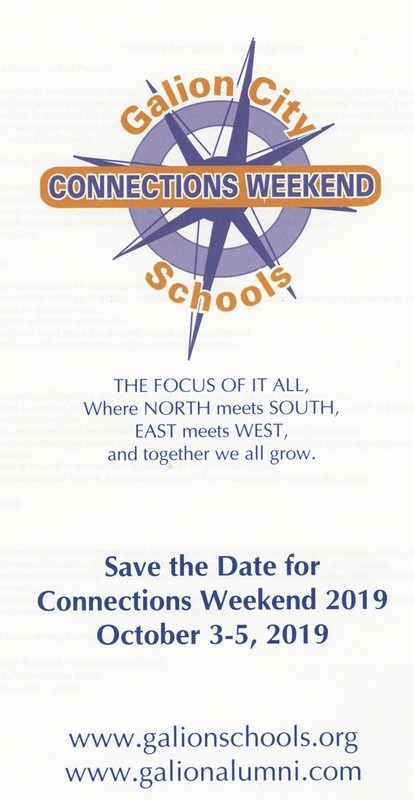 Reunion Activity Announcements: This is a good place to find your Class Contact member to register your address changes - both email and street addresses. Finding lost classmates is a major problem at reunion time. Those of you coming directly to this page might want to check out our home page. We update frequently. Class Contact: We need to have one of your classmate's name and email address and/or phone number to post here. If you are a Class leader you can sign-up for an account and post reunion information under your class.